It’s been 20 years since Soulfly was formed after Max Cavelera left Sepultura. Since then, Max has released 10 more Soulfly albums as well as multiple LPs under the different styled Cavelera Conspiracy and Killer Be Killed. I was listening to past albums as a refresher and even though the music is good and it has Max’s trademark style, it still seemed like something was missing. 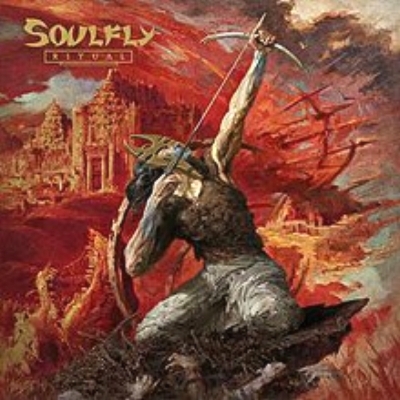 When Soulfly released the trailer EP for their full-length Ritual, I gave it a quick listen and heard what was missing. There was that extra tribal energy from years past. Something must have ignited Max after the Roots tour with brother Igor last year because the sound of the title track is a nice throwback to the old Sepultura sound. In a short clip, Max explains that he was trying to achieve just that because he missed the tribal element which he left out of the past few Soulfly albums. This is a breath of fresh air as we have not had a true Sepultura sounding album in decades. From anybody. Many have tried that are very good, but the original Sepultura lineup led by Max sets the standard for “Tribal Metal”. It’s been 3 years since Archangel came out and the Dead Behind The Eyes EP alone crushed it. What was a nice surprise was that Randy Blythe of Lamb of God did the vocals for the EP title track and Ross Dolan appears on the LP also (in great fashion). Another thing different is that a new generation of the Cavelara clan, Zyon, is the drummer on this album. So far, what we have heard has been well recieved by metal fans far and wide, so what separates Ritual from other Soulfly albums? Ritual opens with the album titled track. Within 30 seconds you are blown away. Between this and “Dead Behind The Eyes”, I already knew this album was going to crush it. Once I heard “The Summoning” and it’s bass filled outro, I was grinning ear to ear. This isn’t Soulfly. This is Max going back to his roots of Sepultura (no pun intended). Ritual is available online through major retailers or grab the digipack CD or vinyl through Nuclear Blast! Ritual is like a time warp back to 1997. Some influence may even date back a bit further. “Demonized” could have easily gone on Beneath The Remains and then changes up into a Chaos A.D. style outro. Then there’s the punkish “Feedback” which has that almost Nailbomb sound. The final track “Soulfly XI” is a nice relaxing cooldown. I enjoyed the tribal spiritual undertones in the instrumental as well as the vintage 80’s style sax playing. This album has it all. Max’s vocals kind of go all over the place each song, which is pretty much his trademark, but it still sounds good to form. You can hear the reignited rage and passion in every yell and scream throughout the album that compliments the energy and brutality of the music. Lyrically, Ritual is what I would call spiritually morbid, which is one of the unique qualities that made Max a legend in the first place. New drummer and Cavelara kin, Zyon, did an amazing job on the drums as he caught the spirit of Max’s vision for this album and channeled it like only a Cavelara could. Zyon definitely has a bright future ahead of him in music under Max’s and Igor’s wing with his obliterating yet controlled family of playing that obviously runs in the family. I seriously enjoyed Ritual as a fan of the classic Sepultura works. Each song just rips through you then lays you to rest with the closing track in a very classic fashion. I could go over each song, but I will sum it up in one phrase. Ritual is a masterpiece for those who fell in love with Sepultura classics like Beneath The Remains, Chaos A.D., and Roots. It’s amazing how it feels like Max just picked up where he left off 20 years ago and he reminds us that he still has the spirit and rage that made the classic work amazing. Ritual also resembles a torch passing to Zyon as well, bringing a new Cavelara generation into the Metal scene of 2018 to continue the legacy that Max had a huge hand in building. Soulfly will be on tour in January 2019 in support of Ritual. Get ticket details here! What did you think of Ritual? Let us know and comment below! Soulfly is a Roadrunner Records and Nuclear Blast Records act and Ritual is available through Nuclear Blast Records. There are various hard copy packages available online. Ritual is also available on most audio streaming platforms including Spotify and Itunes. Find Soulfly on Facebook, Instagram, Twitter and other various social media platforms.